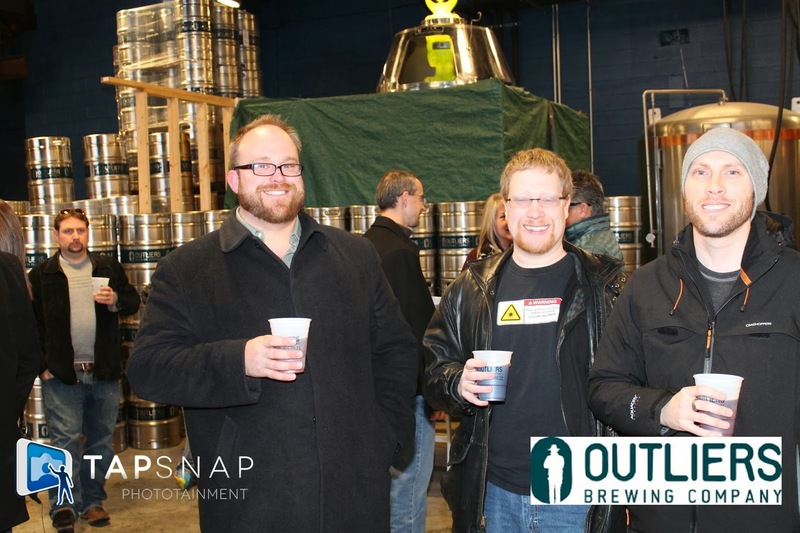 Outliers Brewing Company has been burning up the Twittersphere with their hashtag #ExceptionalIndianaBeer. Because of all the hype, I really wanted to see what they were bringing to Indianapolis with their beer and their vibe. Between the open house and them doing some tap takeovers at various bars, I've been able to try their Buffalo Jacket IPA, Whitcomb Rye and their County Brown. So far, all the beers have been worth trying. I was especially impressed by the County Brown. Its a surprisingly flavorful session beer. Not mostly sessionable, it's totally sessionable, all the way down at 4% ABV. They did an awesome job giving it some serious flavor in such a low ABV package. Now, I really haven't had enough of their beer to do a full review, but we will get to one in the near future. I can tell you that their open house party was exceptional. They had all four house beers on tap. 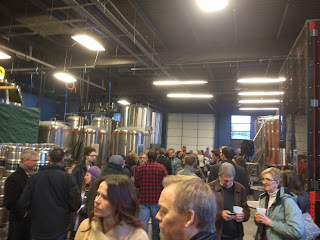 The brewing space is huge, and it was set up with tons of room for people to hang out and drink brews. Der Pretzel Wagon, O-Dawg's favorite food truck, was parked inside of the brewing space. They brought in a DJ, a photo booth (see picture above) and some cool games. There was a frisbee golf tee set up that gave attendees the opportunity to win some brand new Outliers glassware. They were selling merch up front in a little shop area next to the production brewing spot. Sadly, I was only able to stay for a little bit, but everyone was having a great time. They party was great, and I really look forward to seeing what else these guys put out there. The BrewniBomber: Yes, yes a lot of us having been poking fun at the Outliers' hashtag. Questionable marketing aside, I've been looking forward to seeing their space and trying more of their beer. I've had their IPA and the brown, which are both decent, but I'd been hearing that the Whitcomb rye was generating some buzz so I grabbed that at the open house. The rye had some peppery notes (as expected), but I also picked up on some citrus notes as well even though Outliers calls this a "rye beer" and not a rye-PA, which has become popular of late (think Sierra Nevada Ruthless). I enjoyed it and wouldn't mind revisiting it again in the future. As the Big Guy mentioned, the open house was fun and my favorite part was the disc golf. I usually play disc golf every day during Spring-Fall, so a chance to play to win glassware? Right up my alley. Ironically, I was the last of the 3 in our group to win. 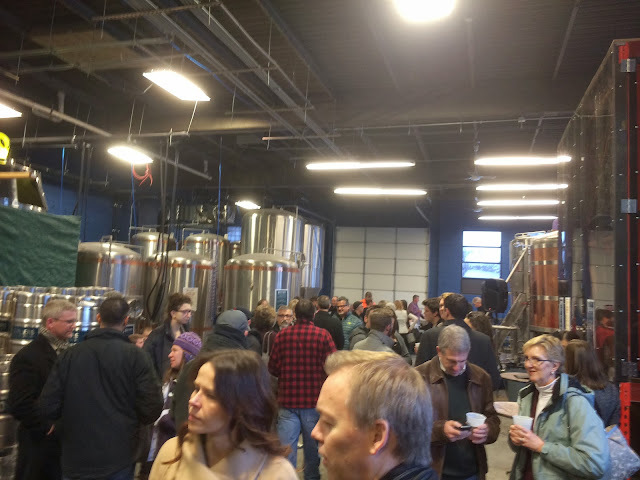 Overall the setup was nice and I could see the place being a popular spot in the Mass Ave area once the taproom opens up full-time in late February. Outliers seems to be a part of a new wave of breweries that put a lot of focus on marketing, promotion, and merchandise... I just hope they will make some beer that lives up to all that. They're off to a good start, but hopefully once established they'll push past the 4 standard offerings they have now.